Ducati have introduced new bikes to their range, the scrambler is a “about town” bike that has been fully kitted out, four times. All bikes comes with a standard 803cc L-twin cylinder 75hp desmodromic air cooled engine, brembo breakes, led lights, 790mm seat height, 13.5lt tank but most important, completely customisable. 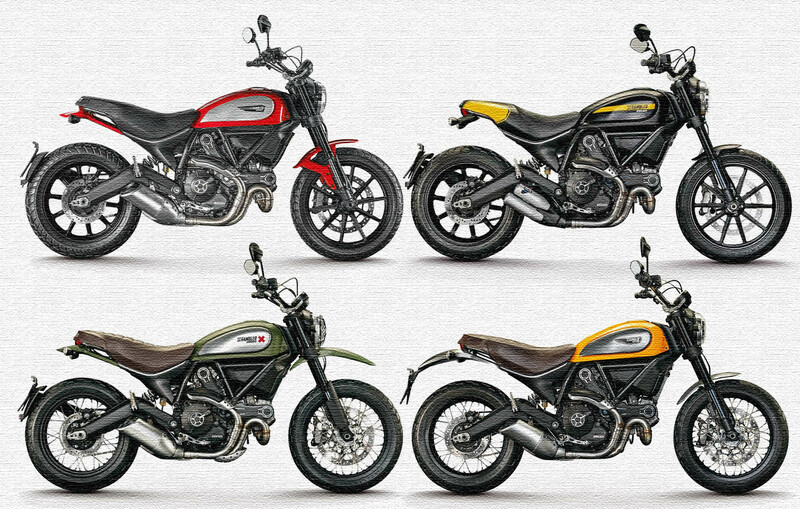 (top left) Icon – entry level model has dual sports tyres and aluminium heat cover. (top right) Full Throttle – is the race edition style. Racing inspired seat, termignoni Mufflers, lower flat track inspired handlebar, sporty tail. (bottom left) Urban Endure – urban with off road style. higher front mud guard, fork protectors, ribbed seat, headlight grill, off road handlebars, skid plate.